← How to discover China off the beaten track – what does it take to preserve Jewish identity if you are a Chinese Jew? October 2012, Forbidden City, Beijing, China. Oh, well, maybe not the Emperor Puyi himself who is long gone – but his nephew, Aisin-Gioro Yuming. Persuaded by his royal family, Yuming has been studying traditional calligraphy and painting since his childhood. 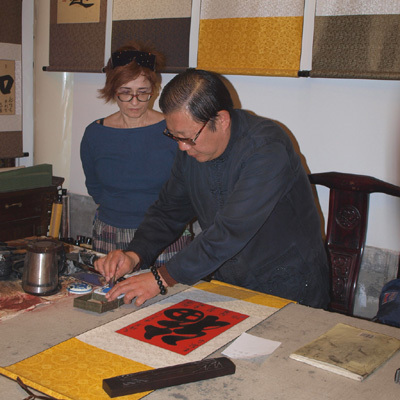 Presently, Mr. Yuming teaches calligraphy at the University and on certain days, you can meet him working in the Forbidden City. Here, Irene is watching how Mr. Yuming is painting on silk a character of happiness for the Shaland family. This entry was posted in Art and Artists, China, Travel Tips and tagged Asia, Beijing, calligraphy, China, Emperor, Forbidden City, travel. Bookmark the permalink.